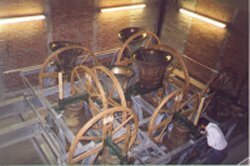 The saga of the bells began in the late summer of 1996 when Dunecht Estate near Aberdeen decided to sell a set of 8 bells cast in 1911 to celebrate the coronation of George V and installed in Dunecht House. The Scottish Association of Change Ringers (SACR) raised £11,000 by interest-free loans to keep the bells in Scotland where there were only 14 sets of operational ringing bells. SACR thought St Mary's Parish Church in Haddington whose "three guid bells" were removed by an English army in 1548 would be an appropriate new home. The cost of the bells plus installation would obviously be substantial. The Friends of St Mary's generously offered to raise the money and to gift the bells and installation so that no cost should fall upon the church. The Kirk gratefully accepted. The project got off to a splendid start with a large gift from a church member and grants from SACR and, through them, the Manifold Trust. The success of the venture did however depend on support from the National Heritage Lottery Fund, Having originally agreed the eligibility of the project the Trustees turned it down, the Appeals Committee asked them to reconsider, the Trustees the approved a grant of £46,500. Thereafter it took nearly a year of negotiation to obtain acceptable conditions for the grant. Building work started at the end of March 1999, the highlight being 19 April when a crane with a 230 foot jib lifted the bells and the associated steelwork, some 12 tons in all, in through a prepared hole in the roof of the tower. Test ringing of the 8 bells took place on Thursday 13 May and the outstanding building work was completed by 25 May. The then Moderator of The General Assembly, the Rt. Rev. John Cairns, dedicated the bells at the 11 am service on Sunday 6 June 1999.